The Cricut Personal Electronic Cutter is the easy to use and makes creating beautiful designs and alphabets easy. 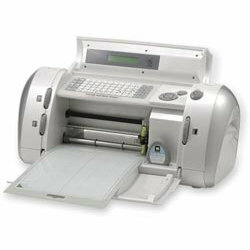 By simply touching a button the Cricut can cut a wide variety of designs and alphabets for card making, scrapbooking and paper projects. The Cricut cuts a variety of materials, including vellum and cardstock. Design cartridges sold separately. Do you have a Provo Craft - Cricut? Tell us your review of your Cricut!